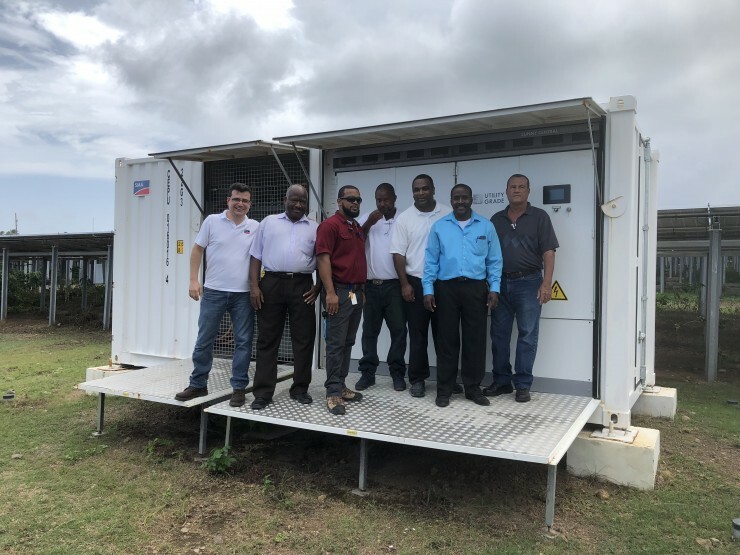 On 15-Oct, delegates of the Anguilla Electricity Company Limited (ANGLEC) visited the island of St. Eustatius for a 1-day tour in the STUCO solar and storage system, the largest Hybrid System in the Caribbean (PV/Genset/Storage) to the date. STUCO’s CEO, Fred Cuvalay, guided and explained to the visitors the operation and benefits of the hybrid solution technology featuring 5 MVA conventional generators, 4.15 MWp PV Power and 3 MW/ 5.8 MWh Energy Storage. The tour started at STUCO’s office for a presentation of state-of-the-art solar and storage technologies, following a visit to the photovoltaic power plant and Energy Storage Containers, continuing later at the conventional power generators and SCADA location, and lastly at the STUCO’s office for a final wrap-up. The information provided on this tour is genuinely valuable for other islands that want to learn and invest in following a similar path in the short term as St. Eustatius, so we are thankful with STUCO and SMA Sunbelt for the coordinating the opportunity to visit and learn, indicated Mr. David Gumbs, CEO of ANGLEC.